SD DISKII Plus firmware updated. It supports FDD and HDD unloading function by dial properly and fixed minor bugs. Exit button added a short delay. Press SELECT (Dial)button long time then It would be unloaded present selected drive. If you want to unload drive 1, Please select drive 1 and LED status. It will erase a present booting file if selected Drive 1. If you have any request, of bugs, please let me know.
! Your APPLE][ must not fail electric power while the firmware updating. If this happens, the SD Disk][ may fail restart, or won't be able to update firmware anymore. In this case, You need to return the board to me for re-programming. 1) Copy new firmware(SDBIOS.ROM) to ROOT directory of SD memory card. 3) Then release buttons, some seconds later then You will see as 'system check..................................' on LCD and S/W terminal screen. 4) A while later, SD DISKII plus will restart automatically. 7) Power OFF and ON and enjoy it. APMSX is completed and commercial gold plated board will be ordered. It is a real Z80 8bits computer, it isn't software emulator nor H/W emulator. The CPLD chips used to optimize the amounts of TTL chips. It works with powerful DMA with APPLE II and MSX mode. 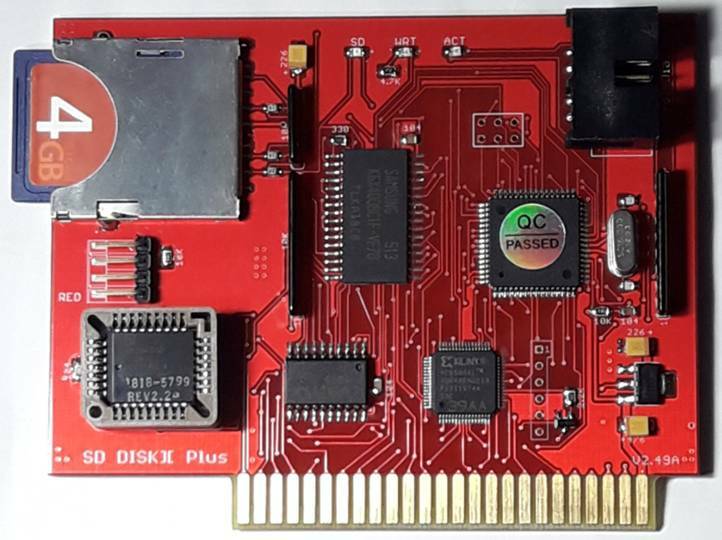 Here is the latest APMSX card. APPLE //e recommended, Full functioning. APPLE IIGS; It has some limitation on dual working with APMSX, limited on Memory card access, But, General running MSX games or programming doesn't have a problem on Apple IIGS. Joystick support and Keyboard even Video output exist. Please refer to the history of APMSX. (2) Z80 Softcard compatible; CP/M 80 operation. MSX IO Ports mapped on $Cn00 hence, APMSX could be used as a VDP card or Sound card similar to the Arcade board. APPLE II can use 512KB memory area on $1000-8FFF so, can use as an extra Memory card. (4) Use Z80CPU for APPLE II as a Co-processor as a Graphics accelerator or sound processor. Z80 could access APPLE II area hance can access HGR and speaker. if 6502 give order function such as graphics, ie circle, paint or scroll then Z80 could calculate and run background for the graphics or sound. It is one idea to use Z80 area and you need programming for it. 32MB HDD emulation is good for APMSX with lots of ROM images. Even one FDD can use but, not many games could put in a DISK. APPLE IIGS works but, no full duplex way. All packaged would be shipped by Registered package with a tracking number and it would take two weeks once it shipped. If you are not sure now, You may buy it on eBay some weeks later but, the price would higher(+10%) for eBay fee. This APMSX card is a real and true MSX computer and successfully connected on APPLE II. It took a long time to develope and it was one of my dream machines. It is 16Mhz Z80 MSX computer. No MSX had this Z80 speed with smooth VDP screen. And more it can share APPLE II resources as it's peripherals And APPLE II can share APMSX resources so, APPLE II can use it as a sound card or another video card. it isn't just a standalone isolated MSX computer. It can communicate to APPLE II on BUS level. Have fun with this card with your Apple II. RCA Video output and 3.5mm Stereo Audio output. Changed Sound chip to AY3-8910 and an SRAM for VRAM but, We have no Slot of the MSX. It optimized for work on APPLE //e. It now supports 16Mhz but hard to play some games. too fast. It would be a good MSX who like to make a game on MSXBASIC. This testing is that APMSX is using the SD DISKII Plus as it's own peripherals. I made a driver to access HDD of SD DISKII plus. It detected as an HDD on MSX and could R/W above 150 files. APMSX works on APPLE //e also APPLE IIGS with some limitations. But not working on APPLE ][+. I did fix some minor mistakes and ordered updated PCB for completion of the APMSX.